In June, I posted my older son’s sports day. Today, I am posting my younger son’s sports day. 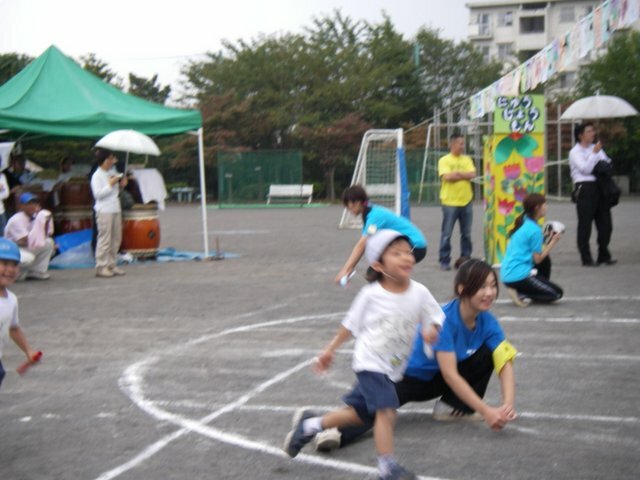 Japanese schools have a sports day, which is the Japanese way and culture. Probably, you don't know sports day. 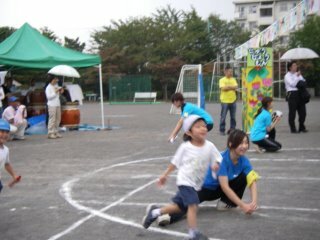 We enjoyed my younger son’s sports day more than my older son’s elementary school's. So, the preschool’s kids are very young. Their ages are from age 0 to age 6. Their dancing and running are very funny. When my older son was young, he ran opposite direction in a running race. Students, who make up to red and white groups, do battle. This picture is of a relay race. Sports days are the best days of all...I love to go watch my kids in their sports. We eat lunch boz in the sprts day. But mothers have to wake up early. Sport days must be fun. I see that parents are allowed to be there, too. It was rainy day, but we enjoyed. sports days are always good for a laugh! When I was in grade school they started doing this here. We would have a whole day of running races and doing other "sports". It would have been fun but the physical education instructor acted like it was the olympics. He screamed at people and got mad when somebody messed up at something. What a jerk. Makes me laugh when the kids run the opposite direction - it's so cute. Thank you for visiting my blog the other day. I am an American who lives in Ukraine. I promise to write more about Ukrainian culture and my life there. Please come back and visit. I like your blog very much and will drop by again. I like Japanese culture too! Especially, NOODLE SOUP! So much fun! We have field day here or when I was a kid (about 35 years ago we did the Mini Olympics!) it was so much fun! I love when you write about your boys It's easy to tell they are Loved! Hello!! My younger son likes the sports day, especially dancing. I need to g0 acupuncture clinic. Kids were cute. When one girl put off her shoes on running race, she put on it… Of course she was late. By the way,I decied we are going to short trip in Japan on this weekend. Oh, do you like NOODLE SOUP? I like it too. There is a lot of NOODLE SOUP in Japan. Some day, I will pot them. Pleas come again my blog. Thank you for comments. I love my sons. But sometimes I felt tired.